BARELY FOUR MILES LONG AND less than a half mile wide, Seabrook Island is among the most exclusive resort and retirement destinations in the Carolinas. Originally inhabited by Native Americans, the island, located 23 miles south of downtown Charleston, was claimed by Lt. Col. Robert Sanford in 1666 for England-s King Charles. It was known then as Jones Island, and rice and indigo were its first cash crops. Cotton was king after Ebenezer Simmons bought the island in 1753 and named it after himself. William Seabrook purchased the land in 1816 and gave it its current name. Today, Seabrook Island is known for its beautiful beaches, tidal marshes, creeks and wooded trails and for its efforts to make sure these natural resources are maintained for generations to come. Seabrook is home to two magnificent golf courses, Crooked Oaks and Ocean Winds, designed by Robert Trent Jones Sr. and Willard Byrd, respectively. In addition to world-class golf, residents and visitors can enjoy the experience of playing courses that are fully-certified Audubon Sanctuaries, home to more than 80 species of rare birds, including bald eagles.
" ...Seabrook is a top-rated tennis resort... "
Seabrook also is home to a wide array of mammals, including raccoons, grey squirrels, marsh rabbits, red fox, otters and white-tailed deer, and more than 30 species of reptiles, such as alligators, tree frogs, chameleons and turtles. They thrive in the fertile creeks and marshes and in forests dominated by oaks, palms, pines, hickories, magnolias and sweet gums. Seabrook has no chain restaurants or gaudy shops, and the businesses that operate on the island do so in subdued buildings with little signage. Strict building codes ban hotels and high-rise condominiums. Golf is not the only game on the island. With 15 composition clay courts, Seabrook is a top-rated tennis resort, and Bohicket Marina can accommodate yachts of up to 110 feet. Seabrook also features an equestrian center, a fully-equipped fitness center, swimming pools and a game room, and bicycles, boogie boards, crabbing equipment and fishing rods are available to rent. 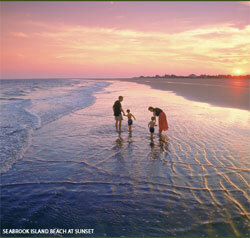 Seabrook Island offers three-and-a-half miles of magnificent shoreline. Pelican Beach, on the south end of the island, is adjacent to the beach club facilities and serves as a backdrop for outdoor events, weddings, sunbathing and spectacular sunsets. North Beach, one of the widest beaches in the Carolinas, is for residents and visitors who treasure their privacy.